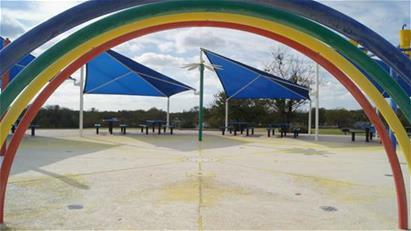 The SprayGround at Hawn Park is a free play area for kids and adults. When the red sensor is pressed water will flow from the play features and the geysers for 5 minutes. The Water Features will run from Early Spring through Late Fall. Each day the water will turn on at 9AM and will shut off at 8PM. The address for Hawn Park is 900 S Dewey St. Note: The Spray Ground may not be reserved for private use. The tables on the Spray Ground area may not be reserved. For information on reserving the parks covered pavilion, you may call the Parks and Recreation Office.